We never bought a high chair for our baby, nor did we ever really need one. Once our daughter was ready for solid foods around 9 months of age, we started baby-led weaning by holding her in our lap and letting her try foods from our plates. She loved to taste new things, and especially loved eating off the “big” plates. Around one year old, she finally got big and wiggly enough that we knew it was time for her to have her own chair at the table as part of the family. So, we invested in a TrippTrapp chair, which she is still using at age 10. If you’ve shopped around, you may have noticed that TrippTrapp chairs (and their competitors Svan and Keekaroo) cost between $150 and $250 dollars—far more than a plastic Costco high chair. You can often find them on CraigsList or eBay for less; they are very durable, and retain their value. Because we had saved thousands of dollars on our baby by breastfeeding, using cloth diapers and not having a nursery, we felt alright about spending the extra money on a TrippTrapp. And besides, a non-toxic place to eat is very important to me. TrippTrapp and Svan chairs (but not the Keekaroo) are made from sustainably-harvested wood finished with non-toxic, VOC-free, water-based stains and varnishes. They are formaldehyde free, with no emissions from their glue. There are no fire retardant chemicals in their cushions, and no PVC, BPA, phthalates or non-renewable, petroleum-based materials in their plastic parts. Ours is still going strong without even a squeak after eight years. The TrippTrapp in particular is very well made, so you can be sure it will last a lifetime with proper care. It can be “recycled” many times and sold or donated from parent to parent. Unlike plastic highchairs, this type of chair won’t live forever in a landfill after it quickly wears out or breaks. This type of high chair is designed to adjust in size for the entire life of your child. It goes from a baby seat to a toddler-booster to an adult-sized chair (and everything in between!) with the turn of an allen key. This type of chair is designed to be pulled right up to the table with no tray, and to match the decor of your dining set or your child’s room. Your baby can start learning to eat at the table with the family right away, and there is no ugly, plastic behemoth to tuck into the corner of your dining room or kitchen. This type of chair is perfect for Baby-Led Weaning. 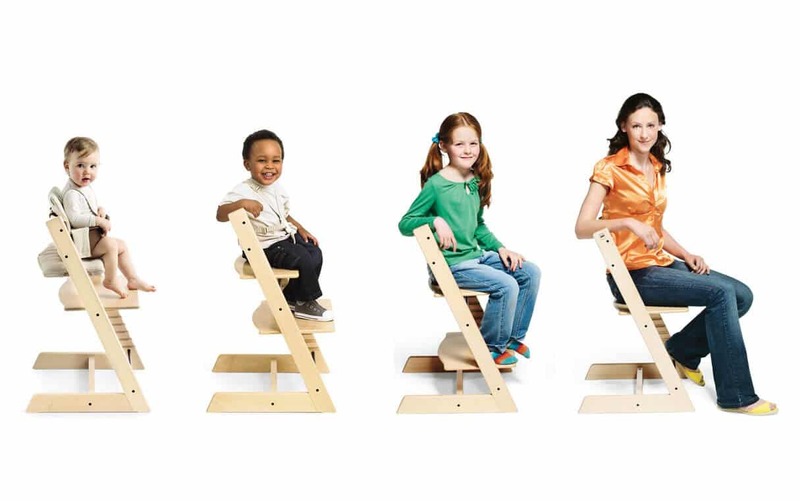 Most kids love the TrippTrapp because it looks like a grown-up chair, but it’s made just for them. Our daughter was no exception, and often climbs into her chair at the dining room table to color with crayons while I research and write these articles. So, if you are expecting a baby (or know someone who is), and you need a high-chair, consider investing in an eco-friendly, adjustable wooden child seat that will be with your child long after her baby years.